Oil on canvas, c. 12 x 20 in. Born into English aristocracy – the Earls of Wandesforde – James (a.k.a. Juan, Ivan) was taught the exacting technique of watercolor painting at a time when the medium was used to make photographic-like transcriptions of landscapes, portraits and botanical studies. Between c. 1847 and 1857 he honed his technique in Canada where he operated a sawmill at Trelawney. In the late 1850s he exhibited artworks in New York and, in 1862, moved to San Francisco. His arrival in California coincided with the great age of Northern California landscape (c. 1860-1880) when the detailed Hudson River School style (Romantic Realism) prevailed. In San Francisco he segued from income-producing jobs such as teaching art and producing watercolor portraits to painting landscapes and still lifes. Wandesforde became an integral member of San Francisco’s art community. In his studio the San Francisco Art Association was formed in 1871, he served as its president, and he took many sketching trips with fellow artists. 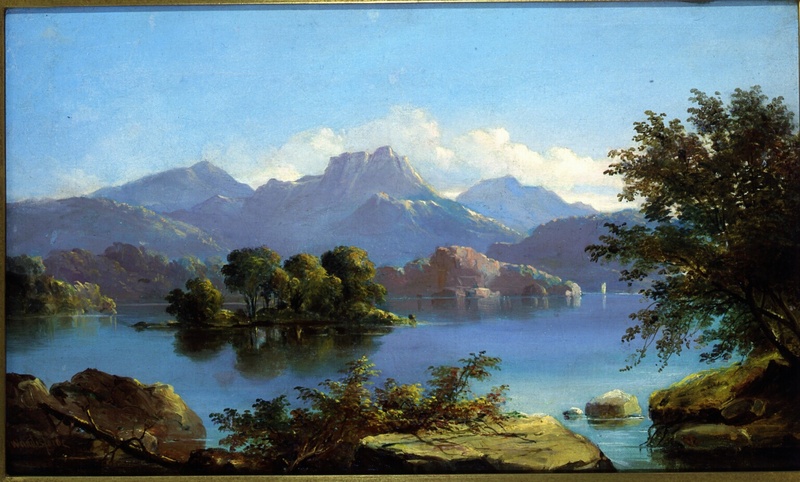 The location of the rather idealized Untitled (Mountain Lake) is unknown although Wandesforde sketched at Clear Lake. The coloration, technique, and brushwork are similar to other works he painted c. 1868. Wandesforde’s pictures are rare since a fire consumed his Hayward studio in the 1890s. Provenance: estate sale, Glendale, September 1985; exhibitions and publications: exhibited, 75 Works 75 Years Collecting the Art of California, Laguna Art Museum, Laguna Beach, Ca. April 2 - July 11, 1993, and reproduced in the catalogue in color p. 12.